I hope so. Nothing – no political program or official government statement – can compete with human contact. We need more exchange programs that allow both sides to learn first-hand what is valuable in the other. Only people who’ve never ventured beyond their own borders are able to maintain a stubborn national approach. But culture has always been multinational. For example, for a classical musician, it’s perfectly normal to work with musicians from all over the world. In fact, it’s almost impossible to sell artists any form of nationalism as a fixed identity. Furthermore, when I attend, say, a literary festival in Sydney, I don’t limit myself to the German stands. Instead, I venture out and speak to other authors as peers, no matter where they come from. Plus, my readers come from all over the world. Business is also fully international these days, and nationalism simply no longer plays the role right-wing forces would like it to. We’re seeing the reemergence of an old order, like a monster out of the sea. But we all know the future will be multinational and multicultural. This multiculturalism is precisely what scares far-right thinkers. How can we communicate to children and adolescents that racism is the wrong path to take? Storytellers like myself have been doing exactly that for ages. My books promote friendship, cooperation and admiration for others. I write fantasy books. They teach kids how to deal with things that are different. In general, stories make it possible for us to slip into other people’s skin and see the world from their eyes. Every book is capable of that. When I read, I enter into someone else’s mind. That would imply that right-wing thinkers either don’t read books or don’t understand what they’re reading. There are plenty of very bad books on sale these days. There are also evil books out there. It’s strange how easily we forget this. So you would say they haven’t read the right books. We all seek out books that portray the world the way we want to see it. Robert Louis Stevenson wrote a wonderful essay in which he suggests that readers don’t read books for the plot threads we authors spin; what they really want to do is to see and understand the world through our eyes. This means they seek out the eyes they like best. If someone wants to see the world through racist eyes, they’re not going to choose to read my books. People like that will reject Harry Potter books, too, because there are witches in them. People like that will want to ban Huckleberry Finn. It’s become trendy to ban books because they might hurt readers’ feelings, even among the left. What do you think about that? Populist thinking fed by fear cannot lead to anything good. But I’m torn. On the one hand, I don’t want to ban books. Freedom of expression is a basic human right. What do we do, however, when members of the Ku Klux Klan and right-wing radicals want to take to the streets to express their views? Presumably, we have to allow that. But there have been deaths at demonstrations recently, even in the US. And we cannot expect people whose grandparents were victims of lynchings to tolerate the KKK roaming the streets. I find it equally unacceptable to ask fellow Jewish citizens to tolerate neo-Nazis marching past them shouting anti-Semitic slogans. As a Western democracy, shouldn’t we respond to this by saying that one of our most important values involves respecting the rights of others? For me, freedom of expression ends when people start inciting hatred and intolerance. But perhaps it’s better not to ban these right-wing parades and instead just laugh at them! Would you say there is too much tolerance in these cases? If we insist on limiting freedom of expression where we disagree with people, it might backfire on us. Right-wingers will just turn around and say, good, well then, no one is allowed to wear a veil in school. I would say that as long as no one’s human rights are being violated, every individual should be able to live the way he or she wants and believe in the God he or she wants to. But it’s not a human right to be allowed to insult someone or to call for violence; that’s where freedom ends for me. At that point, we have to have the courage to say: that is illegal. Is it possible that people’s fear of new and strange things is justified now and then? For example, job losses and globalization without state regulation? Is this what makes us want to huddle together in small groups? Yes, it’s scary how fast the world is changing. And we simply cannot allow right-wing groups to be the only ones addressing these fears, especially the fears relating to refu­gees. After World War II, Germany welcomed millions of refugees from the east. If it was possible back then, why is it a problem today? Those individuals were predomi­nantly German-speaking people, displaced persons and refugees. This is true, but today’s immigration is giving Germany a major opportunity to get something back that we had before WWII. As a country, our culture was more diverse back then than it is today, plus we were funnier, we had a greater sense of humor and we were more educated. But then we destroyed everything that embodied those virtues. Today, we’re seeing new and enriching aspects coming into Germany from other cultures. If we take America as an example, it’s easy to see what kind of cultural richness results from these new impulses. The country has always defined itself by way of immigration – even if Trump doesn’t want to recognize this fact. I’m a big fan of the multiplicity of voices, tastes and colors. I miss that when I’m in Germany. When I look around here, I think, everything is so white. I wish we could get everybody in Europe to get their DNA tested. Then we would recognize where we all come from. Nobody would be able to insist that they’re “from here” and others are “from somewhere else.” We’re all mixed-race. But it’s not about blood, it’s about cultural background. This is what so many people in Europe are afraid of, not just the right-wingers. Are these fears justified? As a woman, I cannot condone girls being prohibited from going to school or women prohibited from marrying whomever they choose. It is important that every nation speaks out against such things. We have an obligation to criticize and, in part, to fight against them. We have to support everything that feeds our values. We have to educate immigrants and provide them with professional training. It will cost a lot of money, but it’s the only way we will be able to get something back. We cannot allow immigrants and refugees to be ghettoized from the very beginning and prevented from working. If we do it right, this wave of refugees can enrich our culture. Incidentally, this is a wave of migration we are deeply implicated in, that is, one that we triggered due to our own economic and political policies. And now we’re all sitting on our yachts complaining about the rafts filled with poor people who want to come to our shores. Our first impulse is to build walls and fences. In this sense, Europe and the US have something in common. But what exactly was the trigger? The Iraq War in 2003, which politically destabilized the region? That was certainly a major trigger. Unfortunately, however, the seeds of violence have always been there in multiple ways, whether as a result of colonialism or fascism. If I had been born Jewish, I would no longer believe that my neighbor had peaceful intentions. The seeds of past violence will continue to sprout. Some refugee movements are even the result of our aggressive colonialism. These days, many Europeans are self-righteous and unwilling to face their colonial past. Most importantly, in the din of all the chaos we cause each other every day, we never get to the point where we recognize the key theme we should be facing as humanity, namely climatic disaster. Instead of focusing on our dying planet, we are entirely obsessed with our own daily affairs and power struggles. Later generations will scold us for being so preoccupied with nation­alist ideas while our climate collapses around us. And, of course, we continue to believe today that it’s up to us to decide whether our planet continues to exist or not. But it won’t be us destroying the planet. It will be the planet destroying us. 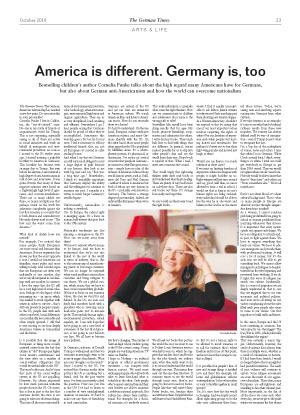 Peter H. Koepf spoke with Cornelia Funke at the launch of “Deutschlandjahr in the USA” on Aug. 25, 2018, in Berlin. is a bestselling children’s author. The Treaty of Versailles signed 100 years ago was not a peace agreement based on reconciliation, but rather a continuation of war by other means. However, the idea that it led to the failure of the Weimar Republic is also a historical myth. Who is John Maynard? For many Germans, the ballad of this heroic helmsman is inextricably linked to Lake Erie and the city of Buffalo. Its author, Theodor Fontane, was born two centuries ago this year.